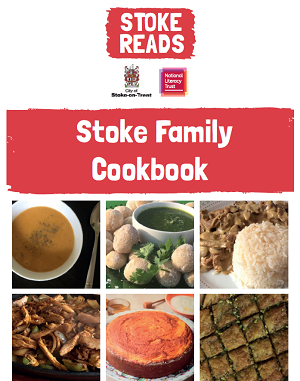 In 2018, people across Stoke-on-Trent were invited to submit their favourite family recipes to the Stoke Family Cookbook – and the finished cookbook is now available for Stoke residents to pick up for free. Including a mix of classic Staffordshire recipes like oatcakes and lobby, as well as lots of recipes from other cultures including baklava, chicken biryani and shashlik kebabs, the cookbook features a diverse range of voices from across the city. The cookbook was created as part of the Stoke Reads campaign, which is led by us and Stoke-on-Trent City Council, in partnership with the City Learning Trust. Recipes were shared by members of the public and pupils from schools throughout Stoke-on-Trent. Schools with recipes featured in the cookbook include Trentham Academy, Glebe Academy, Excel Academy, Burnwood Community Primary School and Birches Head Academy. Local author Kate Leake shared her recipe for apple crumble, while Paul Salvatore, Senior Community Coach at Stoke City FC, sent in his recipe for pasta with broccoli, garlic and chilli. The cookbook is split up into starters, mains and desserts, with each recipe author sharing why their family like the recipe. Everyone featured in the cookbook has been sent a free copy, and members of the public can pick up a cookbook for free at City Central Library while stocks last. A digital version is also available to download and print from stokereads.org.uk . Download the Stoke Family Cookbook now.